This security poster illustrates the M18A1 United States Anti-Personnel Mine. This directional mine is also known as the ‘Claymore’ and is extensively copied. The mine features scissor legs for deployment and a convex body with the lettering, “Front Towards Enemy.” While this anti-personnel mine is generally command wire activated, it can also be used with a trip wire. 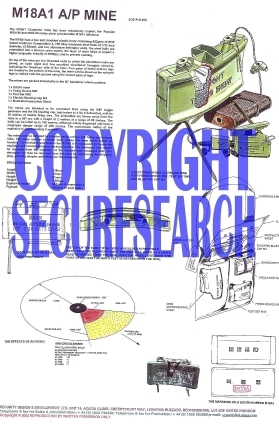 This security poster features a sectioned M18A1 Claymore mine with firing device M57, test set M40 and blasting cap M4, the top view of an early M18A1 with a moulded in peephole sight, the back view of the M18A1, with the peep sight, and the mine packed into the M7 Bandoleer as well as the M7’s other contents. The security poster also contains the technical specifications of the M18A1 anti-personnel Mine, a diagram of the effects of an M18A1, and the markings on a South Korean M18A1. A sectioned M18A1 Claymore mine with firing device M57, test set M40, and blasting cap M4. The mine packed into the M7 Bandoleer as well as the M7’s other contents. The top view of an early M18A1 with a moulded in peephole sight. Back view of the M18A1, with the peep sight. A diagram of the effects of an M18A1. The markings on a South Korean M18A1. The technical specifications of the M18A1 Anti-Personnel Mine. This security poster features the technical specifications of the mine, a sectioned M18A1 Claymore mine, the top and back view of an early M18A1, the mine packed into the M7 Bandoleer, a diagram of the effects of an M18A1, and the markings on a South Korean M18A1.